Alaska Gov. 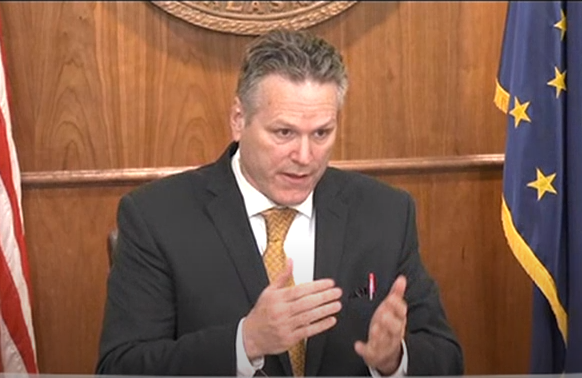 Mike Dunleavy spoke for half an hour at a news conference Tuesday, and his words made clear that he thinks lawmakers aren’t doing enough to cut the state budget. 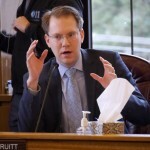 His sharpest point, however, may have been in a silent message: the red pen tucked into his breast pocket, which was a reference to Dunleavy’s ability to cut the budget himself. Lawmakers have so far rejected many of the steep cuts to public schools, ferries, health-care and the university system proposed by Dunleavy, a Republican. But before the Legislature’s budget can take effect, it stops at Dunleavy’s desk, where he can use that red pen to eliminate or reduce spending on individual programs through the line-item veto. In Alaska, the governor wields line-item veto power stronger than in all 49 other states. That’s because it takes a three-fourths majority of the state Legislature to override such vetoes, while most other states require a two-thirds vote. The history of Dunleavy’s line-item veto power dates back more than a half-century, to the constitutional convention in Fairbanks that began in 1955. At the time, delegates were frustrated both by how little power territorial Alaska had over its own affairs, and by inefficient governance from local federal bureaucrats. So they wanted to design a strong executive branch, balanced by a robust Legislature and independent judiciary, said Vic Fischer, the convention’s sole surviving delegate. The delegates made a concerted decision to create a higher bar for overriding vetoes of spending bills and items: They defeated a motion to lower it, to match the two-thirds majority needed to overturn vetoes of ordinary legislation, according to the convention’s minutes. “You cannot exercise a strong executive arm unless you have a strong control on the purse strings,” Steve McCutcheon, the delegate who chaired the convention’s committee on the Legislature, said at the time. In fact, Dunleavy’s predecessor, independent Bill Walker, famously used his line-item veto power in 2016 to cut Permanent Fund dividends roughly in half, to $1,000. Citing the state’s huge deficit, Walker also vetoed hundreds of millions of dollars in cash tax credit payments to oil companies, along with money for the university and to pay off debt from public school construction. Last year, Walker and state lawmakers filled a big chunk of the state’s deficit with revenue from Alaska’s $64 billion Permanent Fund. But in doing so, they cut residents’ annual dividends roughly in half from what they would have been, had lawmakers calculated them using a decades-old legal formula. 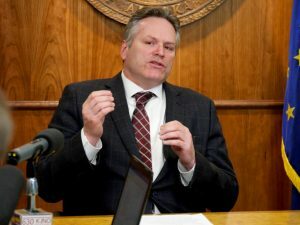 Dunleavy campaigned on boosting dividends, and when he introduced his budget in February, he proposed to pay for them by making steep cuts to government services: public schools, health care, ferries and the university system. The state House has moved toward reducing Dunleavy’s proposed dividend and adding back much of the money for government programs that he wants to cut — though it’s still advancing significant reductions to spending on health care and school construction debt. Dunleavy doesn’t have the power to add money back to the dividend once lawmakers approve the budget. But he’ll be able to use his line-item veto to reduce spending on specific programs – and at his Tuesday news conference, he said he’s waiting to see what the final budget looks like, once it moves through the Senate. One concern voiced by lawmakers opposed to steep spending cuts is that Republicans might feel pressure to support any vetoes made by Dunleavy out of partisan loyalty. But, Kiehl pointed out, if Dunleavy goes too far with vetoes, he could end up uniting lawmakers against him, across party lines. Like, if the budget he signs has something for everyone to dislike: cuts to ferries that Southeast Alaska depends on, to school construction debt payments that are important in the Mat-Su, and to the university system, which is centered in Fairbanks.